NATIONAL SECRETARIAT MEETING OF THE CONFEDERATION OF CENTRAL GOVT. EMPLOYEES &WORKERS WAS HELD AT NEW DELHI ON 20-11-2018 UNDER THE PRESIDENTSHIP OF COM: K.K.N.KUTTY. THE FOLLOWING ARE THE IMPORTANT DECISIONS TAKEN IN THE MEETING. HONOUR ASSURANCES GIVEN BY GROUP OF MINISTERS. REGULARISE GDS & CONTRACT, CASUAL LABOURERS. STOP THE DISASTROUS NEO-LIBERAL POLICIES. DEFEAT THE RULING CLASS POLITICS BEHIND IT. National Secretariat of Confederation unanimously decided to make the two days nation-wide strike on 2019 January 8th & 9th a grand success in the Central Govt. Employees Sector. The decision of the Central Headquarters to postpone the one day strike on 15-11-2018 and to organise two days nationwide strike on 2019 January 8th & 9th is ratified by the National Secretariat. 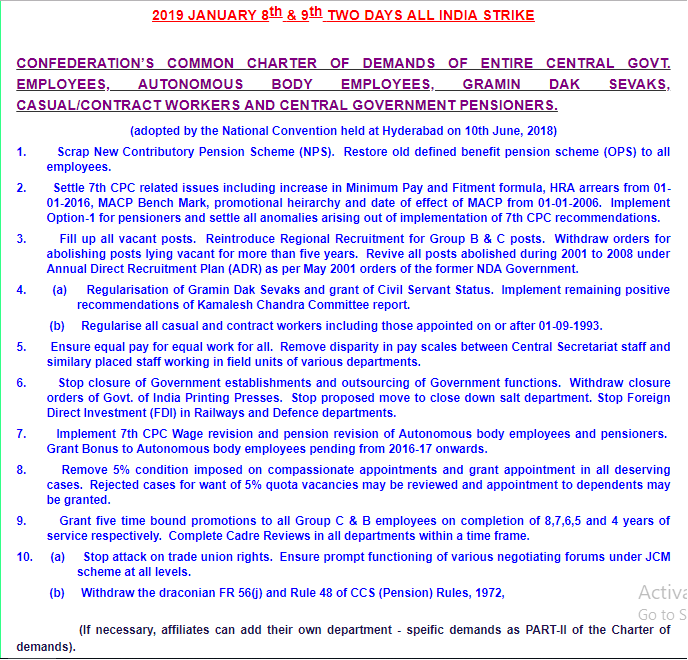 Srike will be organised on 10 points charter of demands of Confederation (reproduced below). First and most important demand of the strike will be “Scrap NPS & Restore OPS”. In connection with the strike, following decisions are taken. 1. Strike campaign is most important. The message of the strike and the demands raised should reach each and every Central Govt. employee and pensioner. Notices, pamphlets, posters etc. should be printed and circulated among all employees. Maximum campaign through websites, journals of affiliates, print and electronic media and social media should be made by each affiliated Unions/Associations/Federations and C-O-Cs. The campaign should be intensified in the coming days. 2. 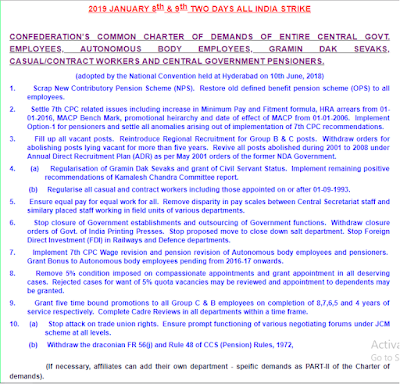 Each affiliated organization of Confederation should issue separate circulars to their lower units instructing them to participate in the two days strike and also to orgaise intensive campaign programmes for ensuring 100% participation of employees of each affiliate in the strike. It is noticed that, during previous strikes, some of the affiliates had not issued any separate circulars and no specific instructions to participate in the strike was given to their lower units. This has created problem for other organisations also at the lower level. This time every affiliate should issue their own circulars to lower units. 3. All State/District level C-O-Cs should convene their managing body meetings immediately and work out detailed plan for intensive campaign among the employees under their jurisdiction. C-O-Cs should play an effective and leading role in making the strike a grand success. 4. All affiliated organisations should plan and announce their own separate campaign tour programme of their leaders for organising strike at all centres and all offices. This is most important. Unless the leaders of affiliates make their own campaign tour programmes, the strike cannot be organised in an effective manner in all units. 6. Strike notice should be served by each affiliate seperately to their departmental head on 12-12-2018 (6th anniversary day of 12-12-2012 one day strike). Confederation Central headquarters will serve strike notice to Cabinet Secretary on 12-12-2018. Copy of the strike notice should be served to all lower authorities also organising mass demonstrations of maximum employees. Complaints are received that some of the affiliates never serve separate strike notice to their Departmental head and also never circulate the copy of the strike notice served to lower units. As a result, when C-O-C leaders approach, their lower unit leaders say that they have not received any instructions from their Central headquarters to participate in the strike. This time Central Headquarters of all affiliated organisations should serve strike notice to their departmental heads and should also issue instructions to their lower units to participate in the strike. Affiliation of those organisations which are not serving strike notice or issuing instruction to their lower units to participate in the two days strike will be withdrawn, as their is no meaning in continuing the affiliation of those organisations which do not implement the decision of the National Secretariat of Confederation. 7. If due to unavoidable circumstances, any organistion cannot serve the strike notice on 12-12-2018, they may serve the strike notice on any other day before 23-12-2018. 8. Even though all the leaders of Confederation and its affiliates are well aware of the full details of each demand raised in the 10 point charter of demands including NPS, it is decided to publish detailed note on each demands in the Confederation website in coming days as campaign material and talking points. 9. As almost all Central Govt. employees and pensioners are agitated over the unhelpful and negative attitude of the NDA Government, there is every possibility of making the two days strike a thundering success, provided the leadership of each affiliates and C-O-Cs rise upto the occasion and start mobilisation now onwards with all seriousness. Our wages and other benefits are under attack. Our job security is under attack. Our social security is under attack. Our trade union rights are under attack. Let us intensify our struggles from defensive to offensive and defeat the anti-worker policies of the Government. Central Govt. employees can do it under the banner of Confederation. Make the two days strike historic success. Remember, we are not alone, the entire working class of India belonging to Banks, Insurance, BSNL and other public sectors, State Govt. employees and Teachers etc. etc. are all on strike on 2019 January 8th & 9th. Don’t be a spectator, join the strike proudly and be a part of the fighting working class of India. Our slogan is “change the disastrous neo-liberal policies, or else we shall change the Government”. National Secretariat of Confederation has decided to observe 12th December 2018 (strike notice serving day) as Demands Day raising the demand - “Scrap NPS & Restore OPS” throughout the country. All affiliates and C-O-Cs are requested to observe the day in a befitting manner by conducting demonstrations in front of all offices, organising gate meetings/general bodies and also wearing badges with the slogan - “Scrap NPS & Restore OPS”. The struggle against NPS is getting intensified day by day. Delhi State Govt. has passed a resolution in the State Assembly demanding the Central Govt. to scrap NPS imposed on Delhi State Govt. employees. State Govts. of Kerala, Andhra Pradesh and Tamilnadu has already appointed Expert Review Committees to submit recommendations regarding modalities for scrapping of NPS and restoring OPS. Tamilnadu State Government employees and Teachers (all organisations) have decided to organise indefinite strike demanding scraping of NPS and restoration of OPS. Confederation is in touch with other organisations in Central Sector and is exploring the possibility of organising higher form of trade union action including indefinite strike. After the two days strike on January 8th & 9th, an All India Convention of NPS employees along with other like-minded organisations will be organised. Our ultimate aim is to organise an indefinite strike, no sooner than later, exclusively on one demand ie; “scrap NPS & Restore OPS”. National Secretariat meeting decided to organise an All India Trade Union Camp of Confederation. Venue, date etc. will be finalised in consultation with C-O-Cs shortly and detailed circular will be issued thereafter. All India Women’s Trade Union Camp of Confederation was held at Haridwar (Uttarakhand) on 29th & 30th October, 2018. Com.Subhashini Ali, Ex-MP, inaugurated the camp by taking a class on the subject - “Indian Working Class - Challenges and opportunities”. Second class was by Com.Keerthi Singh, Advocate, Supreme Court on the subject - “Women’s social status and rights in the Indian Society”. Third class was by Com.T.K.Rajalakshmi, Editor, Frontline on the subject - “Media and Politics”. Concluding session was on the subject - “Scrap NPS & settle Confederation’s 10 points charter of demands - significance of 2019 January 8th & 9th two day’s strike”. Com.M.Krishnan, Secretary General, Confederation, Com. Giriraj Singh, President, NFPE, Com.Vrigu Bhattacharjee, Secretary General, National Federation of Civil Accounts Employees Associations, Com.S.B.Yadav, General Secretary, All India Postal Accounts Employees Association, Com.Worlikar, National Federation of Atomic Energy Employees, Com.D.B.Mohanthy, General Secretary, P4 Union (NFPE), Com. Virendra Tiwari, General Secretary, All Idnia Potal SBCO Employees Association addressed the concluding session. The Camp was presided by Com: Usha Boneppalli, Chairperson, Women’s Sub Committee who delivered a thought provoking presidential address. Com. R. Seethalakshmi, Convenor, Women’s Sub Committee made introductory speech. Com.Geetha Bhattacharjee and Com.Manisha Majumdar offered welcome address and vote of thanks on the second day. Com.Virendra Tiwari, Working Chairman of the C-O-C, UP State Committee and Chief Organiser of the camp welcomed the distinguished guests, leaders and delegates during the inaugural session. Com: Anilkumar Chowdhary, Circle President, P4, UP Circle (Shaharanpur Division) presented special shawls to all guests and leaders. The camp concluded at 02.30 PM on 30-10-2018. The Reception Committee made excellent arrangements for the camp. Confederation National Secretariat congratulates the entire UP C-O-C comrades and convey our thanks to them for successfully organising the two day’s camp. CONFEDERATION’S COMMON CHARTER OF DEMANDS OF ENTIRE CENTRAL GOVT. EMPLOYEES, AUTONOMOUS BODY EMPLOYEES, GRAMIN DAK SEVAKS, CASUAL/CONTRACT WORKERS AND CENTRAL GOVERNMENT PENSIONERS. 1. Scrap New Contributory Pension Scheme (NPS). Restore old defined benefit pension scheme (OPS) to all employees. 2. Settle 7th CPC related issues including increase in Minimum Pay and Fitment formula, HRA arrears from 01-01-2016, MACP Bench Mark, promotional heirarchy and date of effect of MACP from 01-01-2006. Implement Option-1 for pensioners and settle all anomalies arising out of implementation of 7th CPC recommendations. 3. Fill up all vacant posts. Reintroduce Regional Recruitment for Group B & C posts. Withdraw orders for abolishing posts lying vacant for more than five years. Revive all posts abolished during 2001 to 2008 under Annual Direct Recruitment Plan (ADR) as per May 2001 orders of the former NDA Government. 4. (a) Regularisation of Gramin Dak Sevaks and grant of Civil Servant Status. Implement remaining positive recommendations of Kamalesh Chandra Committee report. (b) Regularise all casual and contract workers including those appointed on or after 01-09-1993. 5. Ensure equal pay for equal work for all. Remove disparity in pay scales between Central Secretariat staff and similary placed staff working in field units of various departments. 6. Stop closure of Government establishments and outsourcing of Government functions. Withdraw closure orders of Govt. of India Printing Presses. Stop proposed move to close down salt department. Stop Foreign Direct Investment (FDI) in Railways and Defence departments. 7. Implement 7th CPC Wage revision and pension revision of Autonomous body employees and pensioners. Grant Bonus to Autonomous body employees pending from 2016-17 onwards. 8. Remove 5% condition imposed on compassionate appointments and grant appointment in all deserving cases. Rejected cases for want of 5% quota vacancies may be reviewed and appointment to dependents may be granted. 9. Grant five time bound promotions to all Group C & B employees on completion of 8,7,6,5 and 4 years of service respectively. Complete Cadre Reviews in all departments within a time frame. 10. (a) Stop attack on trade union rights. Ensure prompt functioning of various negotiating forums under JCM scheme at all levels. (If necessary, affiliates can add their own department - speific demands as PART-II of the Charter of demands).